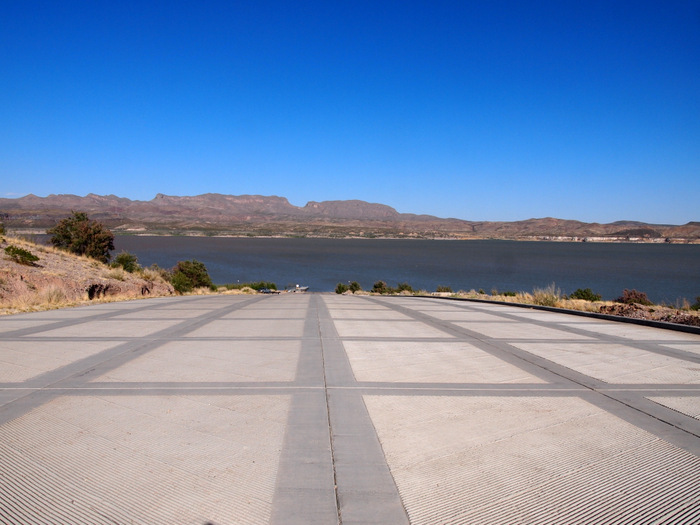 Elephant Butte Lake is the largest body of water in New Mexico. At 43-miles long this lake has tons to offer including an extensive sandy shoreline, three marinas, a 12-mile path that travels along the lake, and numerous camping opportunities. 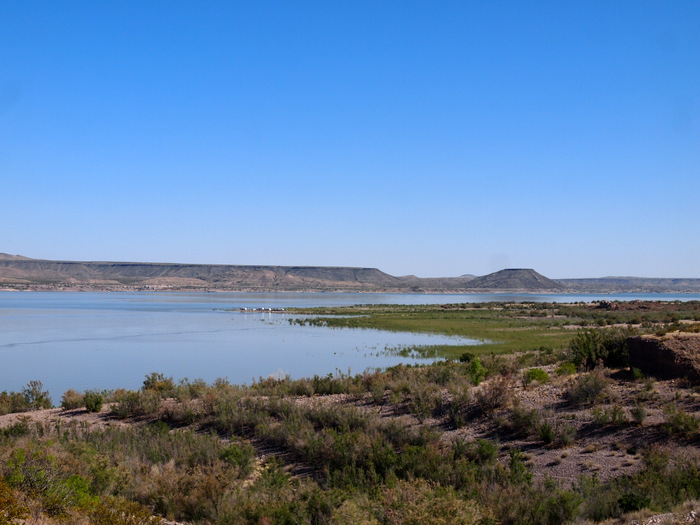 Elephant Butte Lake also happens to be the site of our 5th New Mexico State Park stay. The state park here at the lake is huge. Encompassing 40,000 acres, the park offers up 173 campsites situated among three separate campgrounds, along with countless opportunities for primitive camping near the shore. Following the recommendation of several other RVers we chose to stay at the South Monticello Campground. 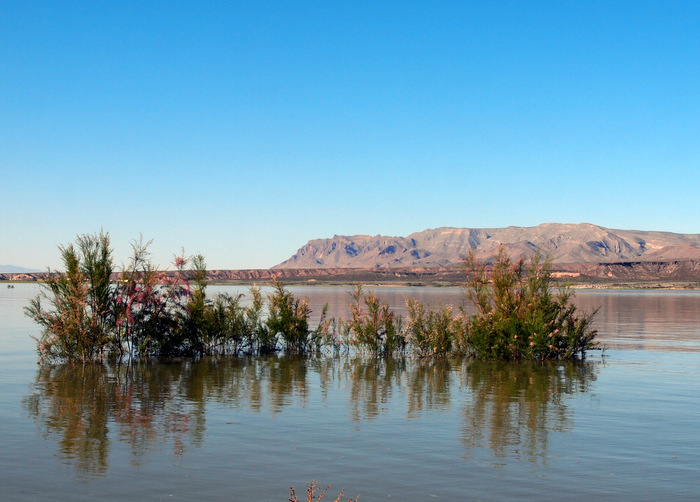 All of the water view sites at South Monticello are reservation only. Since we love a good water view, last week I bit the bullet and made a reservation. While the water view is beautiful, I think next time I’ll save the $12 reservation fee (ridiculous right?) and just take a first-come, first-serve site. The sites are all quite nice here, water view or no. They are large and level with a gravel surface and a concrete pad with a picnic table and shade structure. All the sites have electric and water hook-ups, and are $14 without a park pass ($4 with a pass). The next photo was taken from our neighbors site, and you can see how much space there is between sites. 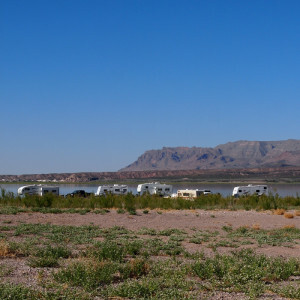 South Monticello campground is located almost at the top of the lake, about 15 miles north of Truth or Consequences – T or C if you want to sound like a local. We don’t mind being this far away from town because from what we saw when we drove through the main campground, the sites are much nicer up here. The other perk to staying here is that we’ve been able to hang out with fellow RVers Julie & Jim from the blog Imperfect Destiny. We met them very briefly last year in CO, and were excited to learn through RVillage that our paths were going to cross again this week. It’s been wonderful getting to know this active, adventurous and fun couple. As always, us RVers have tons in common and we talked about everything from future plans, our inability to settle in one place, and even got to hear all the details about their winter in Mexcio. Fun! We spent one afternoon/evening happy hour-ing in their RV while hiding from the wind. 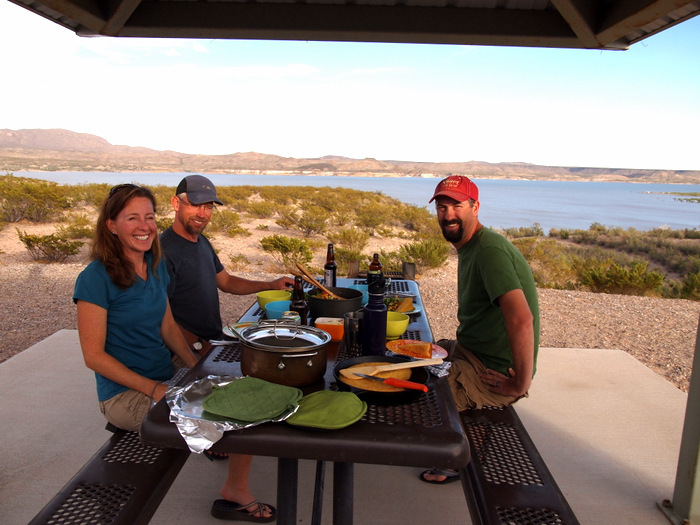 Followed by another evening at our site braving the wind for a collaborated dinner of chili, cornbread and a tasty southwest salad. Without a boat to get out on the water, there’s little to do in the close vicinity of the campground, but we have been enjoying the 12-mile shore trail. The name is a bit misleading since it’s not really on the shore. More like a mile from the shore, and most of the time you only have a very distant view of the lake, or none at all. But it’s a nice gravel path nonetheless. One afternoon we biked down the path for a few miles until we reached the road that goes down to the Three Sisters primitive camping area. 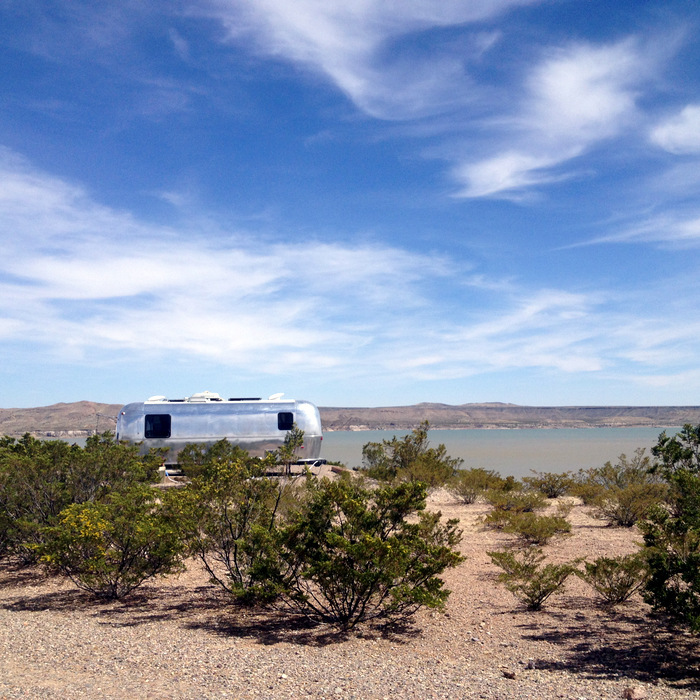 We could see RVs on the beach from our site and were curious about what it was like down there. 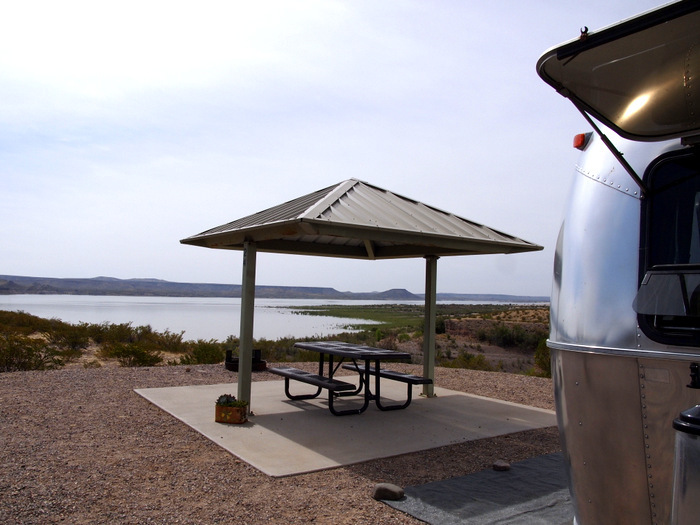 Much like at Caballo Lake, Elephant Butte SP has a bunch of different primitive shore camping areas where you can park your RV, or set up a tent, for $8/night, or free with the NMSP pass. 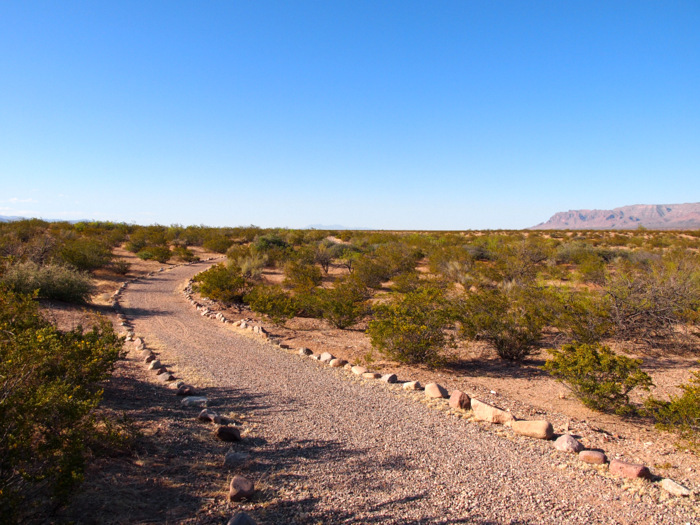 Rumor has it that unlike Caballo, where the primitive camping is on firm gravel, these spots are sandy and unstable. In RV speak sandy means danger. We are pretty adventurous when it comes to the places we take the Airstream, but not so adventurous that we want to get stuck on a soft sandy beach. Which is why his time around we decided to stick with the established sites on firm ground. The road down to the shore had some very sandy sections. Eventually we abandoned our bikes and walked the rest of the way. We did find a few firm areas where we could have parked the Airstream, if we could have gotten to those spots without getting stuck. There’s no way we would have gone down there without scouting it out first, and even then I am not sure we would have gone for it. This group of RVs parked right next to the water seemed to have no problem, but then again we haven’t seen any of them try to leave yet. We also rode down to the boat ramp one afternoon. The very, very long boat ramp. 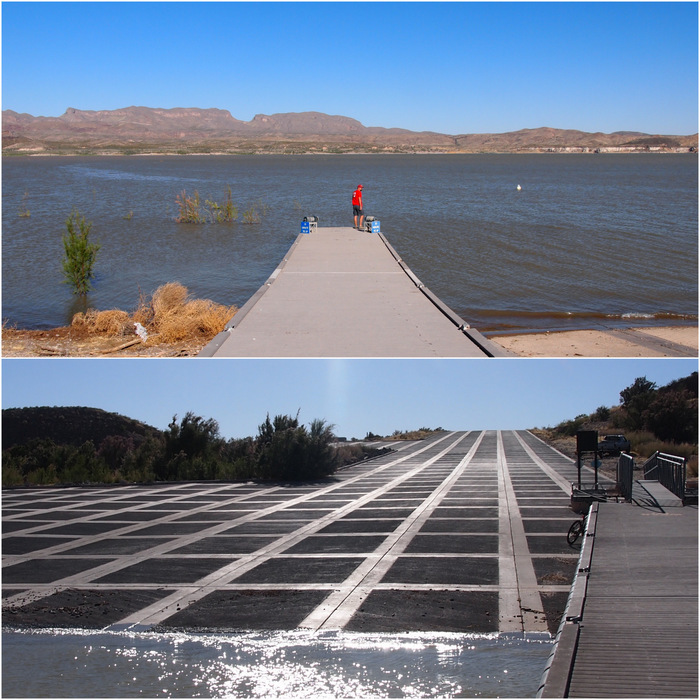 According to the state park website this boat ramp is 980′ long by 60′ wide. No idea why it is so long, but it made for a fun bike ride down – and a tough one back up. I just realized the other day that since we arrived in NM I haven’t mentioned much about the weather. Well, I guess I have mentioned that it’s windy most days, but what I haven’t mentioned is how warm it’s been. Since arriving five weeks ago I don’t think it’s dipped below 70 more than once or twice, and most days it’s much warmer than that. We’ve gotten so spoiled by these warm temperatures that when a cold front went through at the beginning of the week those two days of 60-degree weather left us shivering and piling on the layers for warmth. Yup, we’re now officially cold weather wimps. Thankfully, things quickly returned to normal and by mid-week we were once again enjoying 80-degree temps. The variable weather this week lead to some afternoon clouds, which in turn lead to some amazing sunsets. Finally, here is the updated NMSP spreadsheet. 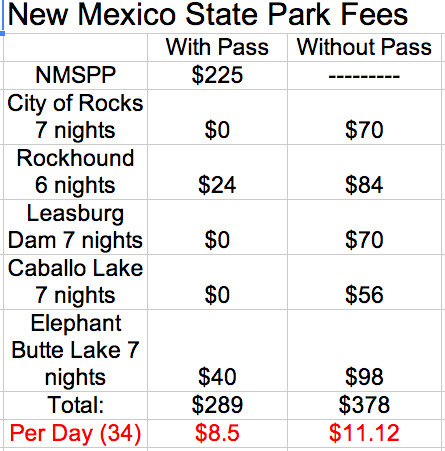 As you can see the gap between the per day cost with and without the pass is growing larger and larger. Even with the extra $12 reservation fee added to this week’s total we’re still at an almost $3 per night savings. This afternoon we’re headed to Albuquerque and will be staying at a private RV park for the week, so I won’t add that to the expense sheet. After that we’ll be going south again for more state park fun. Check out our quadcopter video of the Campground and lake. Love it! New Mexico is so beautiful! 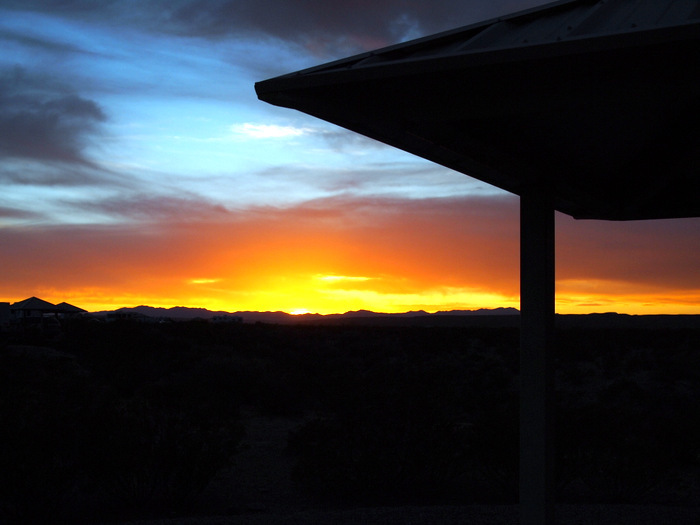 Right across the interstate from Monticello Campground is thousands of acres of free camping on BLM and NF lands. On the way out to the Interstate you actually pass two BLM areas for free camping. There are lots more places to visit all around Monticello. I covered a fraction of them in my blog. Thanks so much for the info! We’re trying to use our state park pass as much as possible this time around, but I’m sure we’ll be back to the area again. Next time I’d love to check out some of the BLM spots. Have you seen the big ‘tow truck’ yet? Being down there near the water looks very risky! We saw it! Plus a bunch of other former military looking trucks pulling 5th wheels. Seems like what you need to be safe on that soft sand. By now, you’ve guessed I’m catching up on my blog reading :) We went to Elephant Butte before Christmas for their “luminary beach walk” (check out our Merry Christmas post), very cool. We were amazed by the long boat ramp also, Hector things they must get tons of boats putting in in the summer. We thought those RV’s by the beach looked sketchy, too. Love your sunset shot.